Enhydris pahangensis Tweedie, 1946: 142. Holotype: BMNH 1947.1.1.70. Type locality: Kuala Tahan, River Tembeling, Pahang, between 500 and 1,000 feet altitude (152–308 m). Diagnosis: Twenty-five scale rows at mid-body, eight upper labials, upper labials 2–3 contact loreal, dorsal scales lanceolate; two pairs of chin shields, five lower labials contacting first pair. Dark lateral stripe on the outer edge of ventral row one, light stripe on rows 2–4. Gyiophis has 25 scale rows at mid-body; but upper labials 1–3 contact the loreal; dorsal scales, particularly those in first row, are ovate. Both Homalophis and Phytolopsis have 25 scale rows at mid-body, but have more than 10 upper labials, and some are horizontally divided. Distribution: Known only from the type locality Kuala Tahan, River Tembeling, Pahang, peninsular Malaysia (Murphy, 2007). Size. The only known male specimen has a total length of 220 mm with a 40 mm tail. Presumably it is a juvenile. External Morphology. This species is known from a single male specimen and the basis for the following description. 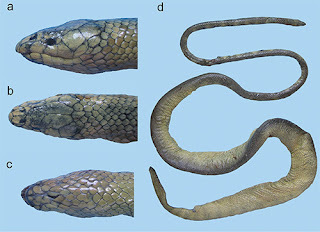 The head is slightly distinct from the neck, the body is cylindrical, and the tail is slightly compressed. The eyes of this species are relatively large, being only slightly smaller in diameter than the eye-mouth distance. On the head the rostral is slightly broader than tall and is in contact with the first two upper labials; it is not strongly notched. The nasal scales are in contact, they are divided and the nasal cleft touches the seam between the first and second labials. The nare is located toward the center of the posterior edge of the scale. The internasal scale is single, diamond-shaped and is isolated from the loreal. The prefrontal scales are smaller than the nasals and make broad contact with the loreal scales. The frontal is pentagonal and slightly shorter than the parietals. The parietals are broad and entire, and bordered by large occipital scales on the sides and smaller occipitals at the posterior edge. The supraocular is single, the preocular is single, and the two postocular scales are about equal in area. Labial number four is under the orbit. The loreal contacts upper labials two and three. Upper labials number eight, and the second and third contact the loreal, the third and fourth contact the preocular; tallest upper labial is number six. There is one primary temporal and two secondary temporal scales. In the secondary row, the ventral scale is largest. On the chin the lower labials number 10. Lower labials 1 - 5 are in contact with the first chin shield and the sixth lower labial is the largest. There are two pair of chin shields with the anterior pair being longer than the second pair. Gular scales number five. On the body dorsal scale rows number 26 on the neck, 25 at mid-body, and 21 in front of the vent. The dorsal scales are smooth and lanceolate, even those in the first row, when compared to most other members of the genus. The ventral scales are broad, round, and number 126. On the tail the subcaudal scales are divided number 57. The scales on the dorsum are similar to those on the body. Color and Pattern. The ventral pattern is a zigzag stripe on the outer edge of each ventral and scale row one. Scale rows 1 - 4 have a cream stripe. Other dorsal rows are uniform brown with scattered dark spots on the back. Natural History. This snake is known only from the type specimen. Nothing is known about its natural history. Based on its type locality it is probably endemic to the Peninsular Malaysian rain forest ecoregion of the Sunda Shelf and Philippines Bioregion (Wikramanayake et al., 2002). The Pahang River is 435 km long, and is associated with several important wetland complexes. It is formed by the confluence of the Jelai and Tembeling Rivers and the Kuala Tahan area is popular for ecotourism. Thus, it is somewhat surprising that more specimens of this snake have not been forthcoming.